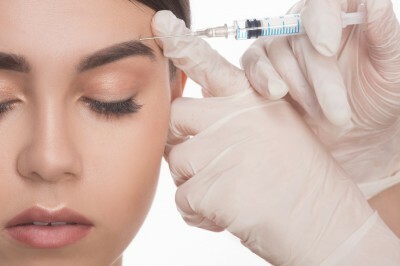 BOTULIN TOXIN are treatments using botulinum toxin. They belong to the most effective methods to reduce existing wrinkles and prevent the emergence of new ones. The essence of the toxin's effect is the relaxation of facial mimic muscles causing the formation of, among others, the so-called. "Lion's wrinkle" or interbritial, the so-called crow's feet - wrinkles at the corners of the eyes, horizontal lines on the forehead. Botulinum toxin acts locally and causes a reversible blockade of neuromuscular transmission allowing relaxation and relaxation of the muscles that cause the wrinkling of the skin. In addition, appropriate application techniques ensure the effect of raising drooping eyelids, raising eyebrows, smoothing the neck, improving the appearance of the chin. the effect appears after 2-3 days, the final effect is obtained after 7-10 days. toxin effect lasts from 4 to 12 months. NEEDLE MESOTHERAPY - Needle mesotherapy treatments involve the injection of a small amount of appropriate medicinal substances into the skin. Mesotherapy improves the appearance of the skin, rejuvenates, moisturizes the smoothness of fine wrinkles around the eyes, cheeks and neck. revitalizes the skin on the crest of the hands. It inhibits the skin's slackness and dryness. It prevents skin aging of young people. it stimulates the repair processes of damage caused by stress, ultraviolet and nicotine. We also use mesotherapy in the fight against cellulite and distention. Active ingredients of the preparations reduce the process of connective tissue fibrosis, reduce fatty tissue deposits, improve skin elasticity. Injections can be made in all parts of the body, including the stomach, especially in women after pregnancy, in the area of ​​the arms, thighs, knees, and elbows. Mesotherapy is effective in the case of hair loss and baldness, both of women and men. It is recommended for people with seasonal thinning hair, hair loss due to baldness, during menopause, and the course of systemic diseases. Injections stimulate hair regrowth by revitalizing hair bulbs and improving capillary circulation. Dermaheal is a line of products for needle mesotherapy that uses the most advanced biotechnology, thanks to which the offer is so unique. The unique combination of unprecedented number of active ingredients, including growth factors and biomimetic proteins, guarantees unique effects in skin and hair care. ELECTROCOAGULATION AND BUCKETING OF SKIN - electrocoagulation is a method that uses the action of electric current of high frequency. electricity is converted into heat which leads to protein coagulation and destruction of the skin substitute. treatments require local anesthesia with lignacaine solution. Indications for surgery: soft fibromas, seborrheic warts, sebaceous glands hypertrophy, viral warts, mili, actinic keratosis, yellow patches, skin keratosis. FILLING WITH HYALURONIC ACID - hyaluronic acid naturally occurs in the skin. The basic task of hyaluronic acid is binding and maintaining water in tissues, which is necessary to ensure tissue elasticity, proper hydration, protection against drying. The amount of hyaluronic acid in children`s skin is very high, which is why the skin tissue looks young. The skin is smooth, supple and firm. With age, the amount of hyaluronic acid in the skin decreases, which becomes visible in the form of loss of unity, reduction of skin tension, gradual slackness. The level of hyaluronic acid in the connective tissue is influenced by: age, stress, ultraviolet radiation, hormonal disorders, metabolism disorders. As a result, wrinkles, furrows, folds are formed, the labial lip disappears, the cheeks fall, the temples fall. The injection of hyaluronic acid preparations aims to fill wrinkles, furrows, moisturize the skin, replenish the volume defects, raise the cheeks, rebuild the cheekbone area, modeling and enlarging the lips, improving contours and facial features. Hyaluronic acid stimulates regenerative processes and production of endogenous hyaluronic acid and collagen. MEDICAL PEELING - peelings are designed to effectively fight the aging process of the skin. They include a strong exfoliating factor (glycolic acid), mandelic acid, depigmenting agents (kojic acid). The acids smooth and hydrate the skin, stimulate cell exchange, delay the effects of skin aging, activate the production of collagen and skeletal skin, and reduce wrinkles. Depigmenting agents normalize pigmentation disorders that cause discoloration. Almond peel exfoliates, regulates sebum secretion, has antiseptic and antibacterial properties, revitalizes, has antibacterial and discolouring properties. The almond acid with its structure resembles broad-spectrum antibiotics. Penetrates into the sebaceous glands by modifying seborrhea. Recommended for the treatment of acne in the case of sensitive skin prone to rosacea and telangiectasia, in pigmentation disorders with post-inflammatory hyperpigmentation. Peelings can be performed throughout the year. The final price of the procedure is determined by the doctor during the medical consultation.